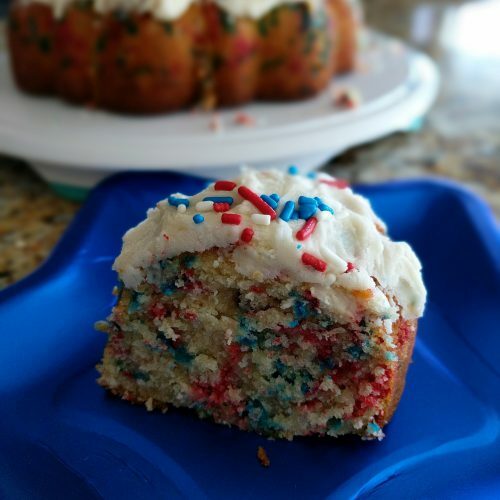 This funfetti bundt cake will bring you right back to your childhood. Growing up all I ever wanted was a funfetti cake! Things haven’t changed too much, because I still get all sorts of excited when I go to a kid’s birthday party and find out they one! 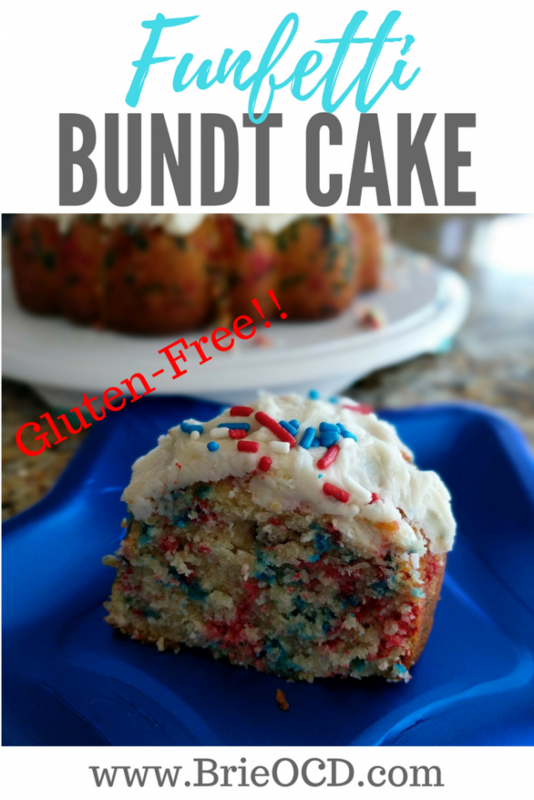 I recently went to a baby shower and they had Nothing Bundt Cake funfetti bundt cakes and I was in heaven! I literally scouted out next to the dessert table and yelled to everyone that they better come have some or it was going to be all gone! 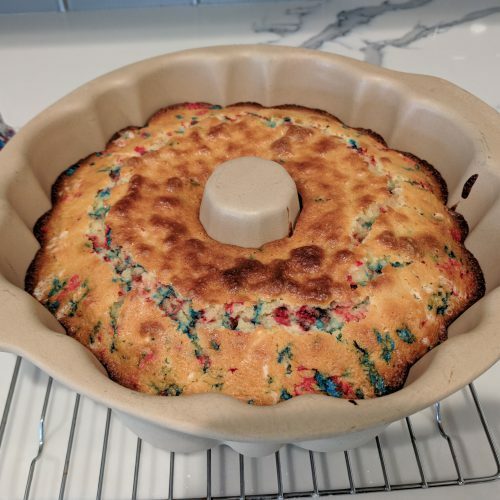 This funfetti bundt cake took me a few tries (3 to be exact) to master but I think I finally got it! The first looked amazing but wasn’t flavorful enough (in my opinion). I went back to the drawing board for the second and it tasted delicious but all the sprinkles fell to the bottom of the pan! The third time I did everything the same as the second BUT I coated the sprinkles in flour before putting them in the batter. VOILA! As I mentioned above, make sure you dust the sprinkles with flour BEFORE putting them into the batter. If you don’t, the sprinkles will sink to the bottom while baking! Also once you stir the sprinkles in, immediately transfer them to the pan and put in the oven. 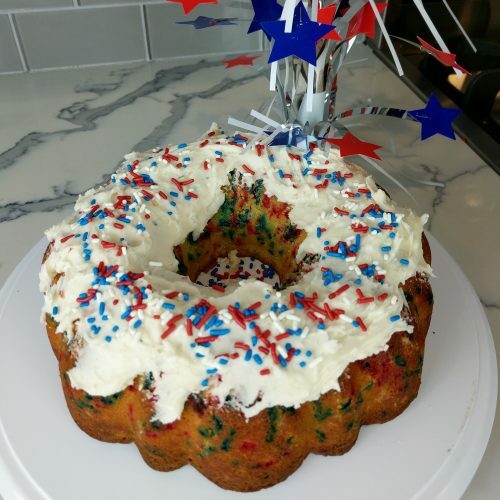 I made this recipe for a 4th of July/Birthday party so to appease a couple of my friends I made it gluten-free! 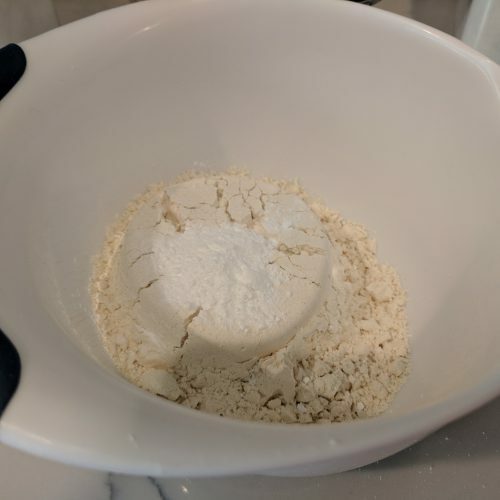 I used Bob’s Red Mill Flour (pictured below) instead of regular flour and bada bing bada boom I had a nice gluten-free recipe. If you don’t care about gluten simply use regular flour and you are good to go! 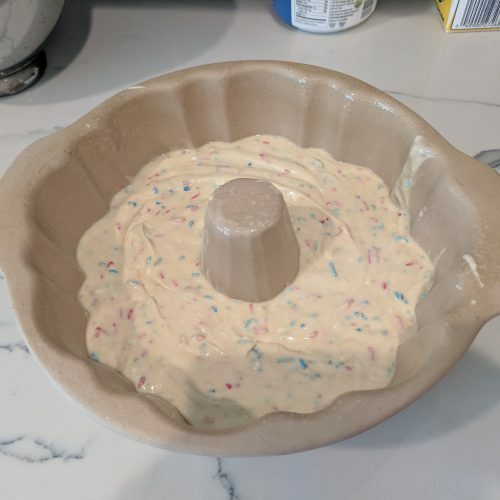 The first time I made the funfetti bundt cake, I made the frosting myself. 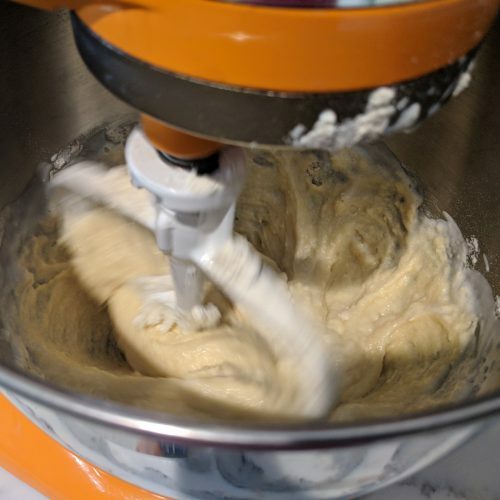 I started with Betty Crockers Buttercream recipe but used French Vanilla Cream instead of milk. (click here for that recipe). Mine didn’t quite look like Betty’s but it was good just a bit harder to spread than canned frosting. The second and third time I made this cake I just used White Fluffy Frosting straight from the can! No shame in my game!! 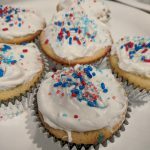 I made this festive for the 4th of July by using red/white/blue sprinkles. However you can use whatever color sprinkles you want to match your birthday theme or that particular holiday! (halloween – use orange and black/brown). Customize, how you see fit! 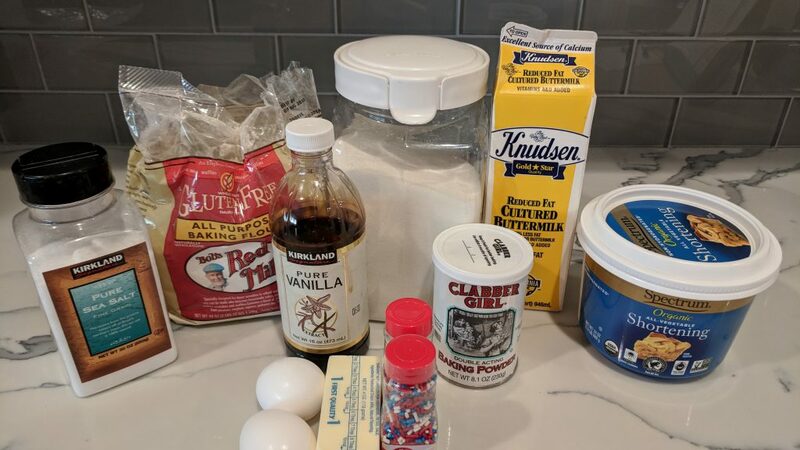 You can use the same recipe below for cupcakes! 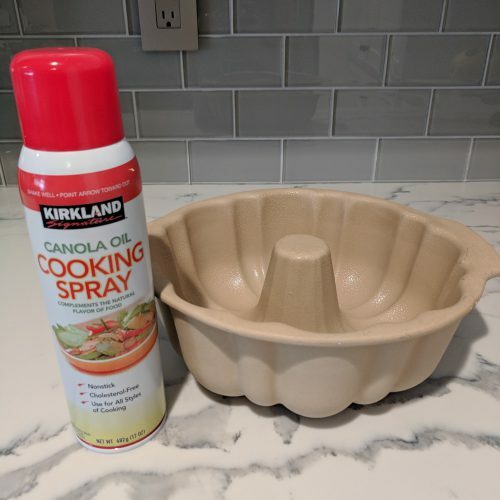 Instead of spraying the bundt pan, line your cupcake pan with your cupcake liner of choice. 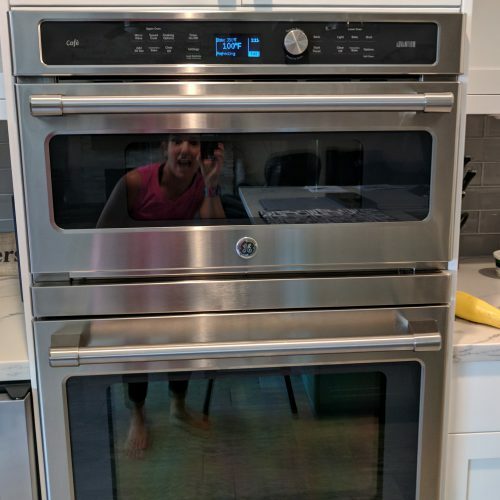 Bake for approx 16 minutes. Be sure to check by inserting a toothpick so that you don’t overcook! The toothpick should come out moist but not wet. Whatever way you decide to cook these I hope you enjoy! 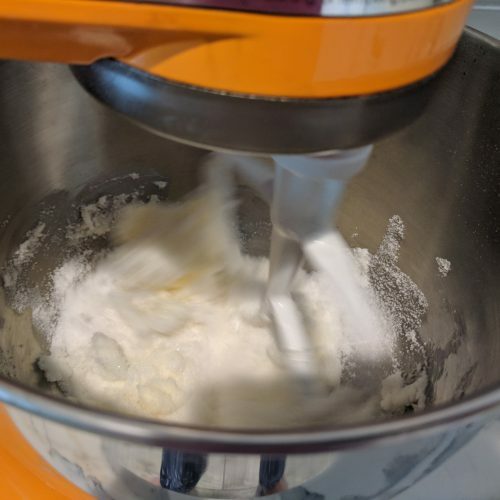 in a small mixing bowl, mix flour, salt and baking powder. set aside. beat in one egg at a time. make sure to beat well after each one. (at least a minute). stir in vanilla extract. alternate stirring in flour/salt/baking mixture and buttermilk until well mixed and batter is smooth. take 3/4 cup of sprinkles and place in a ziploc. Add about 1 tbsp of flour and shake so that the sprinkles are coated. 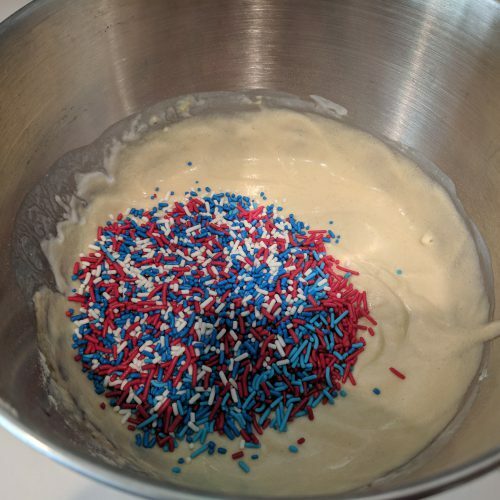 add coated sprinkles to the cake batter and stir lightly so that the sprinkles don't bleed. place bundt pan on metal wire rack to cool for 15 minutes. after 15 minutes flip cake onto tray or serving platter. 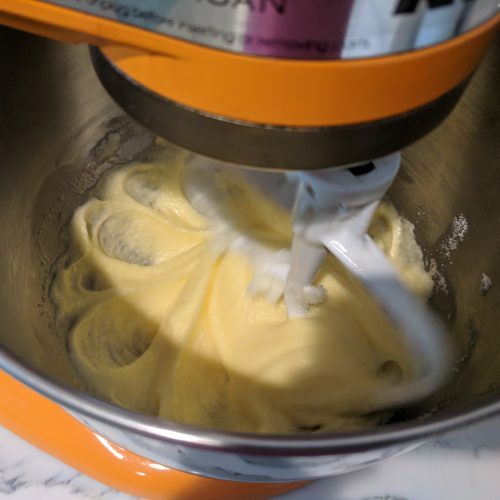 let cool for another 10-20 minutes and then add fluffy white frosting. Top with remaining sprinkles. Enjoy!